The founder of the Fyre Festival - a "luxury" festival in the Bahamas which was called a "complete disaster" by fans - has pleaded guilty to fraud. 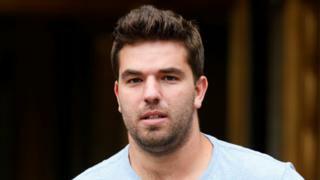 Billy McFarland, who co-founded the festival with rapper Ja Rule, admitted to using fake documents to attract investors to put more than $26m (£18.7m) into his company. The 26-year-old's festival last April had boasted a bill including Skepta, Migos and Blink 182. Tickets had cost between $1,200 and $100,000 (£860 and £72,000), with more than 7,000 people expected to attend. Festival-goers were left stranded on an island in the Bahamas without enough food, water or accommodation. The festival had initially advertised with an Instagram video featuring models Bella Hadid, Hailey Baldwin and Emily Ratajkowski sailing on a luxury yacht. It was eventually cancelled and the organisers apologised and offered full refunds after negative publicity. Billy McFarland pleaded guilty to two counts of wire fraud, in connection with a scheme to defraud investors in his company Fyre Media Inc and a scheme to defraud a ticket vendor for the festival. A document from the US Department of Justice says that "McFarland repeatedly made materially false statements to investors about Fyre Media's revenue and income, and manipulated Fyre Media's financial statements and supporting documentation to hide Fyre Media's true financial condition." Ja Rule was not arrested and there's no suggestion he had any involvement or connection with the fraud. At the time, festival-goers posted videos and photos online of the "mass chaos". One of the stranded people told Newsbeat in April last year that the event was the "biggest scam ever". "It was truly the worst 27 hours of my life," said Lamaan El Gallal. "They had instructed us not to bring any cash with us. Everything was inclusive and we had bands where we put money. "But without cash, it was a huge problem."